The BHS Autopress technology is a batch pressure filter operating similarly to a membrane filter press with the improved benefits of flow in the forward and reverse directions, no bypass of solids or liquids, complete containment and automatic cake discharge from a pressurized enclosure. The Autopress technology consists of circular filter plates and flexible spacers for absolute plate-to-plate sealing. 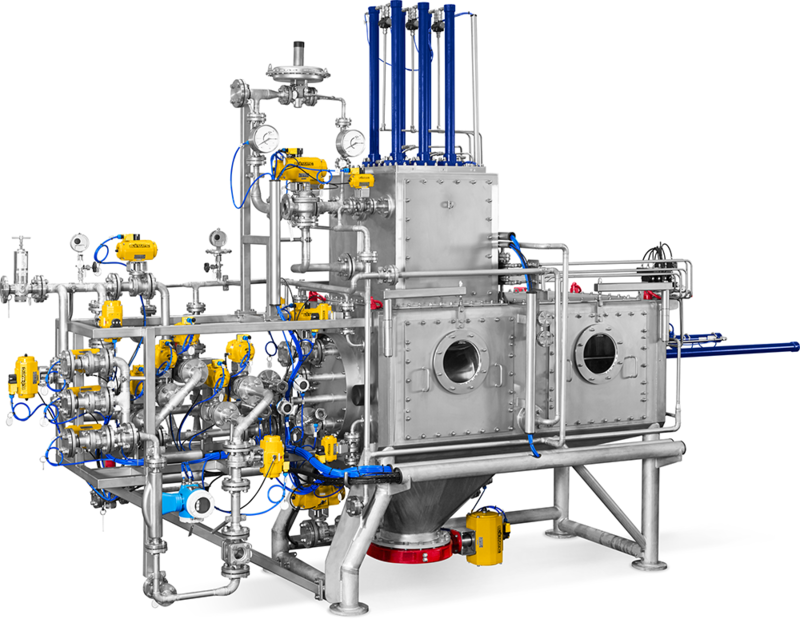 The movable filtration housing forms a pressure-tight seal up to 10 barg around the plate stack via a flexible membrane that is pressurized 1 – 2 bar over the operating process pressure. Automatic and contained discharge is via scraper knives. The Autopress provides for reproducible cake thickness which results in a validated cGMP process operation. The cake can be filtered, washed in the forward and reverse directions as well as dried by vacuum, pressure blowing and squeezing. PLC control is via Batch S-88 standards and automatic Clean-In-Place (CIP) operation is to less than 1 ppm residual cross contamination passing riboflavin tests. To see the animation please visit this page on a desktop or tablet device. Click on the links below to see each animation. If you do not see the animation consider downloading Adobe Flash. Material of Construction: Stainless Steel or Polypropylene internals.